Let’s face it, when you’re a homeowner, there’s no better feeling than the sense of accomplishment that comes from finishing up your own renovations. And why not? Home additions and repairs make a statement that speak ‘pride and ownership’ for years to come. However, some home repair projects require more than casual know-how and a toolbox. Residential concrete pouring projects demand experience than you typical DIY home repair. Indeed, there are so many things that can go wrong when building concrete additions. Continue reading as we show you five of the most common DIY concrete project mistakes. Although there is certainly something appealing about the look and feel of a smooth surface, when it comes to flooring, slick surfaces can cause dangerous accidents. Indeed, if it’s too slippery even walking on flat and dry slab could prove challenging. So imagine the danger of walking on a surface that is both slick and at a slant; this is why it’s critical that you pay attention to your concrete finish. Namely, you want to be sure to add some texture to the surface. One of the easiest ways to add roughness is to sweep the surface of the concrete with a broom. Although you could use an ordinary sweeper, it’s better to use a contractor’s broom as it can help you achieve more consistent lines. However, when using a broom be sure to use parallel strokes that overlap each other and if the surface gets too rough for your liking, then remember to rinse and wet your broom periodically. Forms can make or break your concrete pouring project. Namely because in addition to ensuring that your concrete doesn’t spill over into unwanted areas, forms can also determine the overall appearance of your finished project. Admittedly, constructing the forms and correctly placing them in the excavated area can be a painstaking process. However, as exacting as it may be it is worth taking the time to build them correctly. Uneven forms can have nasty and far-reaching consequences, not the least of which is uneven concrete. So be sure to complete this step correctly from the onset. Before embarking on your concrete pouring project, it’s best to know the final height of the concrete in advance. Not doing so can make for grossly lopsided concrete; this is why you want to pour to the right level. Failure to correctly assess the height could easily require you to redo the project in its entirety, this is not only time-consuming and energy draining, but it can also become expensive. If you’re not sure how tall to build your slab you can always look at the surrounding surfaces for a better idea of a practical height for the project. It is critical that the ratio of water to dry concrete is correct. Ideally, the wet concrete should be smooth, but not runny, dry, or chunky. However, most of the time homeowners make the mistake of adding too much water to the concrete; this is tempting because soft concrete is much easier to work with than dry concrete. But the catch is that water tends to weaken your concrete; this means that you’d be compromising the strength of your surface if you use runny concrete. So remember to use the right amount of water. 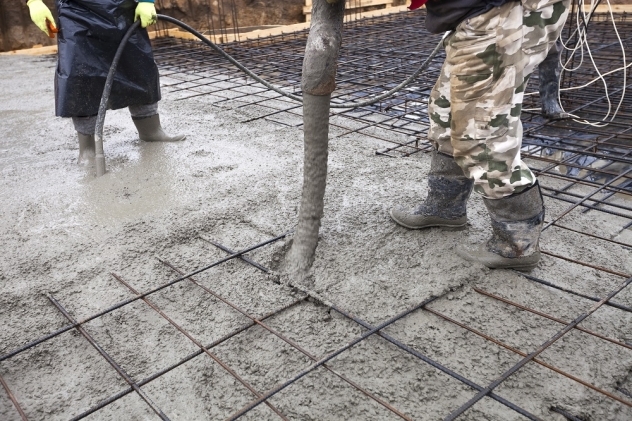 Another common mistake that homeowners make when pouring concrete is failing to reinforce the structure. While it’s easy to skip this step, adding reinforcement is essential. Namely, because while concrete is strong, it still lacks tensile strength. Hence, it’s vulnerable to cracking, especially in places where water doesn’t drain well. It is for this reason that glass, metal or plastic fiber, and even rebar make for terrific reinforcement. They hold the concrete together in case it ever starts to crack, as well as improve the strength of your concrete surface. While it is easy to muddle your DIY concrete projects, the good news is that following the tips above can help you avoid the most common mistakes. We hope that this post has been helpful for you. And always, if you have questions about this post or would like to discuss a particular project call us today at (908) 369-3110.